At Enchanting Travels, we are driven by a genuine interest in giving back and having a positive impact on the society and/or the environment in which we operate and from which we benefit. With this in mind, and to commemorate the Joy of Giving week in India, our Bangalore Enchanters thought up a very special activity. Between 2 – 8 October, members of our team came together to prepare delicious sandwiches and distributed these at the VEDS Rainbow Home for Girls, which houses about 76 underprivileged children between the ages of five to 15. Our Asia Travel Consultant Manager, Ranjana Kishinani, speaks about the experience. We thought that it would be nice to do something every quarter that would not take up too much of our time and also be something meaningful for us. Why did you pick this particular time? 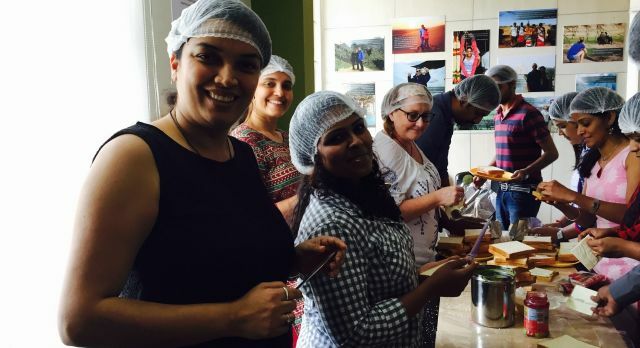 I Volunteer – a social organisation told me about the “joy of giving” week and their initiative to distribute sandwiches at different kids’ homes to bring joy to their day. 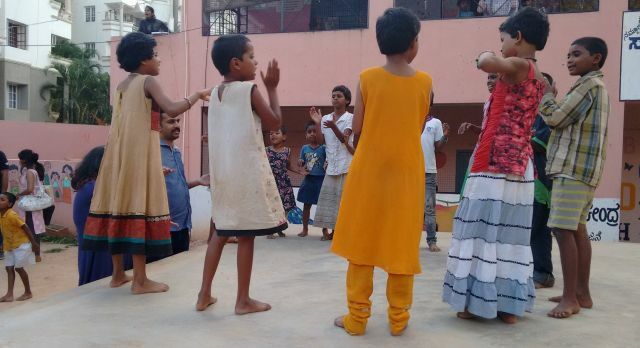 Rainbow Girls home is a government funded home for young girls between 5 to 15 years of age. The girls come from poor families where their parents cannot afford to take care of their education and some are even orphans. The girls stays there and they also study in the school attached to the home. We formed a small internal group where a few of our team members assumed responsibilities to do different things. We decided on what type of sandwiches to make, ingredients, quantities, etc. Then, some of us went to purchase the ingredients. Back at the office, we got together in the conference room and made 200 sandwiches within an hour! It was a fun activity and we joked and laughed the entire time, but we also knew that what we were doing would really make a difference to a few children later that evening. We arrived at the home and were greeted with a wonderful welcome song by the girls. Afterwards, we distributed the sandwiches as everyone gathered around. The young ones were curious and asked us many questions. The only regret I have is that I didn’t know enough of the local language to communicate with them thoroughly. After eating the sandwiches, most of them went down to play and we joined them for a little while. It was interesting. The anticipation and curiosity on the faces of the children showed that they were looking forward to it eagerly, which is something that I have not experienced in a really long time. It was really nice to see that kids will be kids – that they will always like treats and really accept love in all forms. Yes, absolutely! It is a very emotional experience to see how much someone appreciates your time and attention. Enchanting Travels is connected to several non-profit organizations that work hard to provide a healthy and dignified life to the underprivileged. Please consult your travel consultant if you wish to participate and see the work first-hand.